Makeup is an integral part of every women’s life. It is not only a way through which she might want to look good but also a medium of expressing herself using the right techniques, skills and creativity. Such is the significance of makeup that is prevalent in every females life all throughout. But as she turns older, she has to be careful with her usage of makeup according to her skin and age. 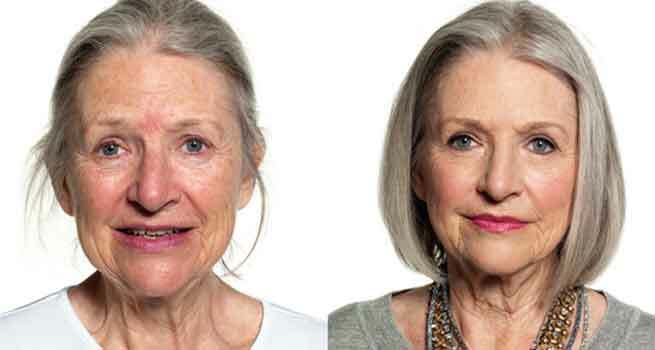 Therefore, for that, here is a quick guide for all the women over 50, and how to go on about makeup after they have turned the age of 50. Irrespective if what we do or don’t, everything will crinkle up and go completely south as soon as we age. We know that our cells won’t re-generate like they used to, or that our skin will lose elasticity and might start showing lines and wrinkles because of our lifestyle. So what is obvious is: wear sun screen everyday. It is the number one cause for wrinkles, brown spots or even sagging skin. This includes your neck, chest and also your hands. Therefore, it is important to clean and moisturise daily with products that will suit your face accordingly and exfoliate few times a week so that you get rid of dull dead skin, put a mask and guarantee your skin glow. A. Blend until it all looks natural and just merge into one another. B. Start little, then keep on adding more. C. Choose the colours that will bring out your eyes instantly in a natural manner. Also Read: How Safe Is Permanent Makeup? D. Keep dark colours at the outer lids of your eyes. E. Set the base for your eyes like you would on your face and don’t forget to invest in a good concealer. F. Too much shimmer is a complete no no unless you want to show ageing. G. Don’t go for harsh colours, Try a soft coloured eye liner. H. Don’t forget to do your eyebrows. If contouring tricks are done effectively, as we have witnessed in many Hollywood celebrities, they can actually take years off your face, highlight the good points that you need to, take weight off your chin as also lift the saggy bits around your eyes and the mouth. Good contouring can also actually make a wide face appear much more narrower and the cheekbones then appear so much more prominent then before. It defines the jawline and lifts your eyes. Once you master the basic techniques, build up your skills and make the most of your bone structure and face. So After turning 50, one needs to control moisturising and colour coverage seasonally. So opt for more in winter and comparatively lesser in summer. It evens out skin tone and you can see an immediate brightening effect taking place. Just layer it over a moisturiser if your skin is very dry, layer some foundation on the top of it. Now, since your skin tone and natural lip pigment will definitely fade with age, go for more vibrant cheek colours. No matter what, always tend to focus on your beauty at that precise moment where you are. Do not ever compare with the way you used to look once, before because that is bound to change. If you must, whiten your teeth because yellow ones will sure look unhealthy. Get glossy treatments to keep your hair shiny and pretty. You can always switch to a clean fresh scent that is beneficial to you, yourself. Treat ageing hands and brittle nails to a manicure every now and then. Double up on the moisturiser when you’re feeling extra tired. Try layering moisturisers to freshen your skin and then fill out the lines if you’re dehydrated. Makeup is a good way to look good, but what is also important is to feel good in you’re own way. Hence, apply makeup carefully but also take care of yourself and be happy.